Draft: 2003, Boston Red Sox, 1st rd. Full name DAVID MATTHEW MURPHY...Wife, Andrea...Two daughters, Madison (6) and Faith (5), and son Cole (3)...In 3 seasons at Baylor University in Waco, TX from 2001-03, he hit .346 (230-665) with 147 runs, 44 doubles, 22 homers and 142 RBI in 172 games…Was named first team All-America by the National Collegiate Baseball Writers Association and first team All-Big 12 as a junior after batting .413 with 11 homers and 67 RBI, and set a Big 12 Conference record with 121 hits, a record that still stood through the 2012 season…Led the league in batting and finished 2nd with 84 runs and 180 total bases…Graduated from Klein High School in Spring, TX in 2000 (same HS as former Indians INF Josh Barfield)...Was very active in the Dallas/Ft. Worth area during his time with the Rangers, donating extensive time and money to SafeHaven of Tarrant County, non-profit organization which exists to end family violence, and Shriners Hospital...Was also very active in the Texas Rangers Winter Caravan. 2014-15 Tribe Fest participant...David gives an annual donation to Cleveland Indians Charities. Spent his first season with the Cleveland Indians, hitting .262 (109-416) with 25 doubles, 8 home runs and 58 RBI in 129 games ... Season got off to a hot start, hitting .284 (21-74) in 25 April games with 4 2B, 1 3B, 2 HR and 18 RBI, tied for the 11th most RBI in April in the American League...Had a pair of 4-RBI games in April, on April 8 vs. San Diego and April 12 at Chicago...Was one of the most reliable hitters in the league with men on base as his .326 (56-172) average wtih runners on was 10th-best in the A.L...For the year he hit .360 (36-100) with runners in scoring position. Was on the 15-day Disabled List (2nd career DL stint) with a strained right obliq ue from August 10-September 4, rehabbing 2 games during the AAA Columbus Clip p ers p layoff run on Sep t. 3-4 (1-6, HR, 2RBI) ...F ollowing his activation in September he hit .259 (14-54) with 4 doubles, 4 runs, 1 HR (last game of the year) and 3 RBI in 20 games...From July 22 until the end of the season David hit .319 (36-113) with 9 2B, 2 HR and 12 RBI in 38 games ...Hit .185 (15-81) in June and had a streak from June 11-30 where he was 2-for 49. Enjoyed a career-game at T oronto on May 14, going 5-for-6 with 3 doubles, 2 runs and 5 RBI ...Tied single-game career-bests in hits (5), doubles (3) and RBI (5)...Had four games of at least 4-RBI on the year...O n the year he made 109 starts in right field (120 games), 2 starts in left field and 2 starts at DH...Was 18th in the A.L. in batting average with two strikes (.234, 44-188) ... Is a career .303 (84-277) in Progressive Field (9HR, 46RBI, 84 G )...Batted .328 (40-122) with 7 2B, 2 HR and 20 RBI in 37 starts in the 8-sp ot in the batting order. ?e Baylor University product owns a career on-base pct. of .337 to go along with his career on-base+slugging pct. (OPS) of .778...Over his 7 years with Texas only Michael Young and Ian Kinsler appeared in more games...In 2012 the left-handed hitting outfielder batted .304 (139-457) with 29 2B, 15HR & 61RBI in 147 games, finishing 6th in the American League in on-base pct. (.380) and 10th in batting average (.304)...Has been on the DL just once in his career. ?e appeared in 27 postseason games during his tenure with the Rangers from 2010-12 (.373OB%/ .759OPS) and owns a career average of .280 (571-2042) against right-handed pitching (.347OB%/.469SLG%/ .816OPS)...Has enjoyed his trips to Progressive Field, hitting at a .365 (27-74) clip with 4 2B, 1 3B, 3HR & 15 RBI in 21 career games...The versatile outfielder has logged time at all three positions during his career and his 35 assists since the 2009 are 8th-most among A.L. outfielders over that span. ?pent his seventh and final season with the Texas Rangers, finishing 3rd on the club in doubles (26), tied for 4th in game-winning RBI (7), and placed 5th in games (142), the latter the 2nd most of his career…Started 106 games in left, 5 as the DH, and one in right...Batting average was never above .229 after a 1-for-3 effort on opening night…Batted .168 in ?rst 28 games through May 3…Hit .328 (19-58) in next 19 games, improving to .229 on May 25…Had a .990 (2 E/207 TC) ?elding percentage in 129 total games in the out?eld (last 77 games were errorless)...Drove in season high 4 runs, May 19 vs. DET and had 11 RBI over 6 games, May 19-25...Pitched a scoreless 8th inning (1 H, 1 SO) in a 17-5 loss on June 5 at Boston. Had the necessary plate appearances to qualify for league leader status for the first time in 2012, and established career highs in nearly every offensive category...batted .304 with 15 home runs, 29 doubles, and 61 RBI in 147 games...had a .380 on-base pct. and .479 slugging mark...was one of only 8 players in the majors with minimums of a .300 average, .380 OBP, and .475 SLG in 2012, one of just 4 in the A.L...became just the 11th different player in Rangers history with such a season, first since Josh Hamilton in his 2010 MVP campaign...started team-high 106 games in left, 12 in right, and 7 as the DH...had the A.L. 's 6th best OBP and 10th highest average...topped the Rangers in on-base percentage, was 2nd in batting, 3rd in intentional walks (7), 4th in steals (10), and 5th in walks (54)...set career highs for games (147), at bats (457), runs (65), hits (139), total bases (219), doubles, and walks...had the league's 7thbest batting average with runners in scoring position at .347...his .335 average at home was 4th-best in the A.L.BETTER HALF: Over the last 3 seasons (2010-12), Murphy's .313 (203-649) average after the All-Star break is 6th-best in the A.L. (min. 500 PA's)...hit .317 (80-252) post-break in 2012, 11th in the A.L...owns a .319 (146-458) post-break figure in a Texas uniform, 3rd-best in club history (min. 300 PA's) behind only Mickey Rivers (.340) and Julio Franco (.322)...batted .366 (37-101) in August 2012, highest monthly figure of his career (50+ PA's)...his .315 (151-480) career average in September ranks 12th among active players (min. 300 PA's)...in 2010, was the unanimous selection as Rangers Player of the Month for September after batting .355 (33-93) with 3 homers, 7 doubles, and 17 RBI in 23 games...ranked among A.L. leaders in average (7th), OBP (9th, .417), and doubles (T9th, 7) that month and led Rangers in average, RBI, and OBP, and ranked 2nd in slugging (.527)...his 36 RBI beginning Aug. 1, 2010 through the end of that season led all Rangers.EAST FEAST: Murphy is a career .32195 (198-615) hitter against A.L. East clubs, the 2nd-highest average among active players (minimum 500 AB's) behind only Ichiro Suzuki (.3221, 720-2235)...hit .322 (38-118) vs. East in 2012 and career-high .363 (41-113) against the division in 2011.TOUGH ON LEFTIES: Hit .347 (26-75) with no HR and 6 RBI against left-handed pitchers in 2012, 6th-highest average in the A.L...it was the highest single-season figure for a lefty hitter against lefty pitchers (75+ AB) in Rangers history, best in the majors since Baltimore's Nick Markakis hit .361 in 2010...Murphy entered 2012 with a .253 career average against lefties.BATTING: Went 8-for-15 in his 1st 5 games and hit .333 (13-39) over season's 1st 13 contests through April 21...batted just .215 (17-79) in next 27 games and was at .254 on May 25...had a .346 (26-75) average in the next 30 contests, improving to .290 through July 3...was 6-for-30 in next 10 games, then hit .399 (55-138) over following 40 games to go from .278 to season-best .324 on Sept. 3, the day he 1st had enough plate appearances to qualify for the batting title...ranked 3rd in A.L. in batting thru Sept. 3...his .366 average in August ranked 3rd in the A.L...had a .229 (22-96) average over final 27 games to finish at .304...had a season high 8-game hitting streak, July 28-Aug. 4 with 2012-best 4 hits, June 27 vs. DET...hit .350/.447/.750 with 4 HR and 12 RBI in 14 Interleague games.SEASON STREAKS: Had doubles in a club-record 7 straight starts, July 24-Aug. 1, the longest such span in the A.L. since Baltimore's Brian Roberts (7), Aug. 9-15, 2004...reached safely in 8 straight plate appearances (6-for-6; 2 BB), July 31-Aug. 1...scored a run in 7 consecutive games, Aug. 19-25...posted a career-high 5 straight multi-hit games, Aug. 29-Sept. 3.HOMERS/RBI: Had the 4th 2-homer game of his career, June 27 vs. DET, tying his lifetime best with 5 RBI (2nd instance) in that contest...posted the 23rd inside-the-park homer in club history, May 19 at HOU...went deep in back-to-back games, May 19-20 and June 12-14...homer on August 13 at NYY ended 32-game HR drought, the 2nd-longest of his career...drove in 15 runs in 14-game span, June 12-28...connected on 1st career pinch HR, May 10 (1) at BAL...was the 1st Ranger ever with an inside-the-park and a pinch homer in the same season...drove in game's only run with a 2nd inning single, April 10 vs. SEAMISCELLANEOUS: Compiled a .995 (1 E/202 TC) fielding percentage, 9th-best among A.L. outfielders with 200+ total chances in 133 games/118 starts...did not commit a miscue in final 131 games after lone error on April 7...had 4 assists...was 3-for-10 with a homer and 4 RBI as a pinch-hitter.POSTSEASON: Has appeared in 27 of the Rangers' 34 postseason games over the past 3 years (2010-12), making 19 starts (18 in LF, one as DH)...had at least one hit in all 6 series for Texas in 2010-11...has .257 (18-70) career average in the postseason with one HR, a triple, 4 doubles, and 6 RBI...went 0-for-2 as pinch-hitter/left-fielder in 2012 A.L. Wild Card Game...set series highs with .412 (7-17) average and 3 RBI in 2011 ALCS vs. Detroit...batted .317 (13-41) in 2011 postseason with 8 walks against 6 strikeouts...hit safely in Games 5-6-7 of the World Series...in 2011 ALCS Game 6 vs. Detroit, went 2-for-2 with 3 walks and 2 RBI, 1st Texas batter ever to reach safely 5 times in a postseason game (later matched by Mike Napoli in WS G6 in extra innings)...in 2010, missed Games 1 & 2 of ALDS vs. Tampa Bay (left groin strain), but had 2 starts in that series...homered in 2010 ALCS Game 2 vs. New York and appeared in all 6 games of that series. Murphy started 62 games in left, 27 in right, and 11 in center...was the club's fourth outfielder for much of the season beforestarting the 29 of the final 30 games of the year beginning Aug.26, a period during which he was one of the Rangers' most productive players...his 120 games were his fewest since 2008(108)...his .401 slugging pct. was lowest in any season in the bigleagues, but he averaged a career-best 7.21 PA's per strikeout. 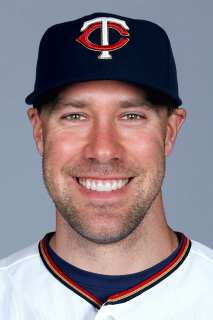 The club's most consistent performer after the All-Starbreak, Murphy ended up starting most of the second "half" afterinjuries to Nelson Cruz and Josh Hamilton ... batted .291 with 12home runs and 65 RBI in 138 games for Texas ... the .291 average,.358 on-base pct., and .806 OPS figure were all the highest in anyof his 3 full big league campaigns ... also posted career highs ingames, hits (122), and stolen bases (14-for-16, .875) ... rankedamong team leaders in games (4th, 138), walks (4th, 45), doubles(5th, 26), hits (6th), total bases (5th, 188), RBI (5th), and stolenbases (5th) ... fell shy of qualifying for league leader status ... suffereda mild left groin strain on Sept. 29 vs. Seattle and missedthe final 4 games of the season ... MRI exam revealed no tear. Murphy rebounded from a 0-for-23 start to bat .269, 3rd-best on the club among players with at least 200 at-bats...fell just 9at-bats short of qualifying for league leader status for the first time...ranked 2nd on the Rangers in walks (tied-49), on-base percentage(.338), and sacrifice flies (9), the latter T4th in the American League, was 4th in doubles (24) and multi-hit games (34), and placed5th in games (128-tied) and steals (9)...established career highs for games, at-bats (432), hits (116), homers (17), walks, and stolenbases...started 96 games in left, 11 as the designated hitter, and 8 in right. Made starts in left (48), right (43), center (9), and as DH (2)...ranked amongthe team leaders in sac flies (T3rd, 6), at-bats (4th, 415), home runs (5th, 15),extra-base hits (5th, 46), total bases (5th, 193), doubles (T5th, 28), triples (T5th,3), games (6th, 108), hits (6th, 114), and runs (6th, 64)...placed 3rd among A.L.rookie leaders in RBI, doubles, and extra-base hits...also ranked among league'srookies in home runs (T4th), multi-hit games (T4th, 31), hits (6th), slugging (6th,.465), total bases (6th), triples (T6th), runs (7th), average (8th, .275), and walks(T9th, 31)...his 28 doubles tied Bump Wills (1977) for the 2nd most ever by a Texasrookie behind Mark Teixeira (29 in 2003) while his 74 RBI are behind just PeteIncaviglia (88 in 1986) and Teixeira (84 in 2003) among 1st year Rangers, mostever for a LHB. Advanced from Portland (AA) to Pawtucket before makinghis ML debut as a September call-up in Boston...combined to hit .269 (132-490) with 40 doubles, 11 HR and 69 RBI in 131 gamesfor Portland and Pawtucket...opened with the SeaDogs, going 5-for-5 with 3 doubles, a triple, and 5 RBI on May 21...establishedfranchise records with 4 extra-base hits in a game and 5 RBI in one inning...was leading the Eastern League with 17 doubles at thetime of promotion from Portland to Pawtucket on May 26...homered in first career Triple-A at-bat on May 26 against Louisville (2ndpitch off Darrell May)...earned International League Player of the Week honors for June 5-11...recalled by Boston on Sept. 1 and singledoff Toronto's A.J. Burnett in first ML at-bat the following night at Fenway Park...hit first ML homer on Sept. 17 (day game) inYankee Stadium off Jaret Wright. Hit 14 home runs in 135 games for Portland, 9 more than his combined total of 5 long ballsin 144 games over his first 2 professional seasons...had team-high 75 RBI...was named Red Sox Minor League Defensive Player ofthe Year after committing only 4 errors in 131 games in center field...played for the Peoria Saguaros in the Arizona Fall League, batting.319 (29-91) with 3 homers, 9 RBI and 20 runs scored in 24 game. After a quick start, endured an injury-plagued campaign with Single-A Sarasota, spending 42 days on the D.L. from June 14-July 26 with a left foot sprain...hit .303 (23-for-76) with 9 RBI and 15 runs in 20 games in April, reaching base safely in 18 straight contests from April 21-May 10...was sidelined by the foot problem from June 2-August 1, but returned to bat .313 (30-for-96) with 3 homers, 19 RBI and 12 runs scored in 26 August games. Advanced to Single-A Sarasota from short-season Single-A Lowell after being drafted by the Red Sox in the first round with the 17th overall pick...batted .346 (27-for-78) with 13 RBI and 13 runs in 21 games for the Spinners to earn a July 8 promotion to Sarasota, where he hit .242 (37-for-153) with a homer, 18 RBI and 18 runs in 45 games...his first professional homer was a solo shot in game 2 of a July 24 doubleheader vs. Lakeland. April 25, 2016 Rochester Red Wings released OF David Murphy. April 15, 2016 OF David Murphy assigned to Rochester Red Wings. April 14, 2016 Minnesota Twins signed free agent LF David Murphy to a minor league contract. March 28, 2016 Boston Red Sox released LF David Murphy. February 29, 2016 Boston Red Sox signed free agent LF David Murphy to a minor league contract and invited him to spring training. February 29, 2016 LF David Murphy assigned to Pawtucket Red Sox. November 4, 2015 LF David Murphy elected free agency. September 5, 2014 Cleveland Indians activated LF David Murphy from the 15-day disabled list. September 3, 2014 Cleveland Indians sent OF David Murphy on a rehab assignment to Columbus Clippers. November 25, 2013 Cleveland Indians signed free agent RF David Murphy. March 14, 2006 OF David Murphy assigned to Portland Sea Dogs.